In communication and media research, the concept of a media/information “ecosystem” has been increasingly employed in recent years, no doubt due to the growing recognition of the networked nature of information in the digital age (Anderson, 2013; Napoli, Stonbely, Friedland, Glaisyer, & Breitbart, 2012). Ecological studies of media and communications systems go by many names, and have been performed by scholars in a range of disciplines – from science and technology researchers using Actor Network Theory, to sociologists who focus on the “field,” to computer scientists using graph theory. In some cases, research in this vein references a “communications ecosystem” (e.g., Peace, Goodstadt, & Agarwal, 2011). 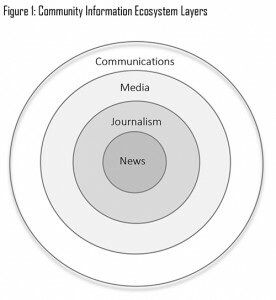 In other cases, the notion of a “media ecosystem” is employed (Napoli, et al., 2012). In still others, phrases such as “news ecosystem” (e.g., Pew Research Center, 2010) or “journalism ecosystem” (e.g., Lewis, 2010) are used. The model in Figure 1 presents a series of concentric circles which, from the center moving outward, are meant to illustrate a series of increasingly broadening ecosystem parameters. The logic here is that, starting from the center and moving outward, we begin with the most narrowly focused analytical orientation. of journalism (the next concentric circle). As Clarke (2014) notes, “while ‘journalism’ and ‘news’ are often used interchangeably . . . the two terms should not ordinarily be conflated” (p. 18). As Clarke (2014) and others argue, news is best thought of as a subcategory of journalism. The former is focused on the reporting of current events; while the latter is more broadly focused, to also encompass content types such as current affairs, documentaries, commentary, and analysis. Is the person’s product intended for the general public? Is the work creative and analytical rather than a simply relay of raw information? Is the reporting based on facts rather than fabrications? Are statistics, honest images unmanipulated, quotations, correct? Does the product convey multiple points of view? Does the person or his organization guard against conflicts of interests that could affect the product? If conflicts are unavoidable, are they publicly acknowledged? Does the person reveal his or her identity and contact information? Does the person publicly correct errors? This set of questions is instructive in that it helps to illustrate a set of parameters via which journalism can be defined and distinguished from other types of informational content that may be available. In this way, the journalistic ecosystem can be articulated as something distinct within a defined community. The analytical scope broadens further at the media ecosystem layer. This layer contains both the journalism and news ecosystem, but also accounts for the content and associated providers that extend beyond the boundaries of journalism. This might include, for instance, cultural or entertainment content delivered via various media platforms. Or it might include content that is more instructive/informational in nature, such as that from a library or a transit authority, rather than meeting the criteria of news or journalism per se. And so once again, the analytical framework broadens to include additional individuals or organizations whose outputs meet these more expansive criteria. Further, via the media terminology, the technologies involved in the production, dissemination, and consumption of content (such as journalism) become integrated into the analytical framework a bit more explicitly. As Adam (2008) argues, “the term ‘media’ pushes technology into the foreground and conceals the fact that ‘journalism’ is one thing and ‘media’ is another. The latter refers mainly to technologies of various effects and uses” (p. 1). Clearly, then, the notions of the journalism and media ecosystems should not be considered synonymous; and thus they are represented as separate analytical layers in our model, with the journalism ecosystem nested within the broader media ecosystem. Finally, we reach the communications ecosystem layer. At this layer, the analytical frame extends beyond mediated forms of communication, to also include the communication that takes place via interpersonal and community networks (e.g., Kim & Ball-Rokeach, 2006). This analytical approach takes both mediated and interpersonal forms of communication into consideration. Within the context of this schema, the present analysis focuses on the journalism ecosystem. We recognize that an approach that focuses on journalism omits a range of important sources of information in a community (e.g., libraries, local government web sites). However, given the extent to which this analysis is motivated by concerns regarding the health of local journalism, given the technological and economic changes that have potentially affected its viability (see above), it is these concerns that have served as the basis for delineating the analytical focus.